The Sennheiser MKE 2 is a professional miniature lavalier microphone and an industry favorite among field audio engineers, broadcast engineers and film crews. With a wide frequency and high sensitivity response, the MKE 2 lavalier is developed for crucial audio reproduction of vocals and instruments. Its omnidirectional polar pattern provides an even frequency response throughout the perimeter of the microphone. The result minimizes handling noise caused by clothing, while providing accurate, transparent audio fidelity without noise. The MKE 2 is widely favored for its superior audio quality and miniature profile. The sub-miniature yet durable design enables the microphone to be used in stage performances, video shoots, film shoots, or anywhere an unobtrusive microphone is necessary. The microphone features various terminations to accommodate wireless transmitters and connectors. Gold series models are designed for broadcast and theater applications. A reduced sensitivity (6.3mV / PA) enables high SPL and lower distortion. Dual-diaphragm design provides protection from perspiration and moisture. The omnidirectional polar pattern provides a consistent frequency response at the direct and off-axis sections of the capsule. The MKE 2 features a wide, linear frequency response for accurate, transparent reproduction of vocals and instruments. The MKE 2's sub-miniature profile enables the microphone to be used on stage or on camera while remaining inconspicuous. Box Dimensions (LxWxH) 4.0 x 3.0 x 1.0"
MKE2 Gold Series Omnidirectional Lavalier Condenser Microphone (with Accessories, Beige) is rated 4.0 out of 5 by 4. Rated 4 out of 5 by Anonymous from Great microphone! Awesome mic, unfortunately I'm using it with an EW 100 G2 wireless system. Sound quality is better than the stock ME 2, but most of the improvement is lost through the EW 100 system. Still, better, smaller, and more durable microphone. Rated 2 out of 5 by basil from Great sound- windscreen broke the mic I got two of these, they sound great. BUT! I put the windscreen on one time for an outdoor shoot, and trying to get the windscreen off (which was very difficult) ripped the connectors to one of the mics. This MKE2 is giving me distortion even though my levels are far from clipping. I got this mic with the Sennheiser AVX bundle and recently shot a training video. My levels peaked around -24 to -12db, however, during playback I can hear high frequencies distort. It gets much noticeable once I process the audio and raise the level. I normally record straight into camera and also into an external recorder with this lav mic, however this issue keeps recurring. Why does this mic keep distorting my sound? Any help or tips would definitely be appreciated! There are a number of things to consider when trying to source the cause of distortion. The question is where is the distortion occurring? Is the mic element overloading due to high SPL, or is the transmitter clipping because of improper gain staging? If the receiver is outputting line level and the input on the camera or recorder is set to mic, that may be the cause. Also, the gain settings on the preamp of the recording device needs to be set accordingly as it is a major part of the audio chain as well. 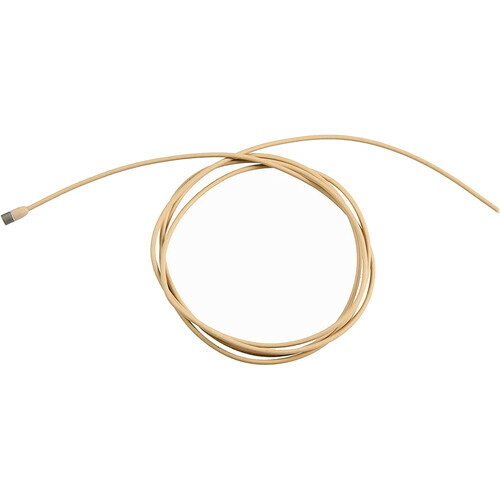 can this be used as a wired lav for a dslr (with a long adapter cable)? Yes it can. But you need a Receiver and transmitter to go to mini to mini on the DSLR. Recording the peaks will be a bit difficult to set up, but it can be done. I have to of these one has a little blue tag at the bottom just beside the mini jack, the other doesn't have a blue tag is there a difference?The one that doesnt have the blue tag is doing a very disturbing humming, can you tell me something about that? Sennheiser changed the cabling last year. The new blue indicator is now wired RED center, BLUE ring and NO Shield. The shield wire is now wired to the BLUE side in the capsule. Do not wire the shield.